The book is very controversial today because it discusses about the workings of the Supreme Court of the Philippines, and the manipulation and changes of the processes and decision by some of the country’s most powerful people inside the Supreme Court of the Philippines. Publisher and distributor backed out on the book project before its printing, and major chain of bookstores also refused to sell copies of the book. 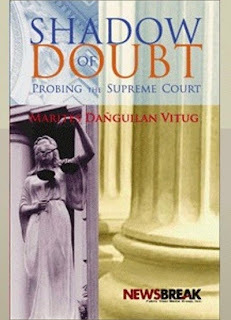 Excerpts from the book, Shadow of Doubt: Probing the Supreme Court can be read HERE. The book is available at Popular Bookstore (Tomas Morato, Quezon City), La Solidaridad (Padre Faura, Manila), UP College of Law; Filipinas Heritage Library (Ayala, Makati); and the Newsbreak office at Unit 202, S & F Condominium, 137-B Panay Avenue, Quezon City; telephone 920-0997; fax 920-3611; email admin@newsbreak.com.ph.